Thank you for considering the Lost Railway Museum for your next private party event. Our banquet room is perfect for parties, receptions, showers, birthdays and anniversaries. 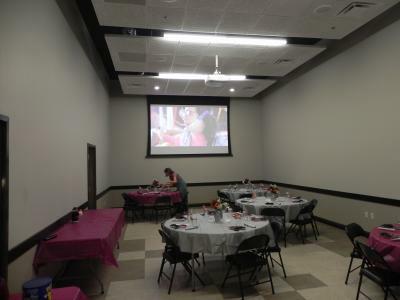 Our banquet room is available for groups from as small as 20 to as large as 60. The room will comfortably accommodate 8 tables with 6 to 8 guests at each table, with the lobby holding one, or two, 30 inch by 8 foot rectangular tables for registration or reception check-in. Please note that there is an additional rental fee for use of the Museum Reception area if you prefer a “roaming” style cocktail party (stand up), where we can accommodate 150 people. Rental is charged for any function outside normal Museum tour hours. Groups of 20 or more will automatically be charged for the entire room and charges apply according to the below listed schedule and time of day. 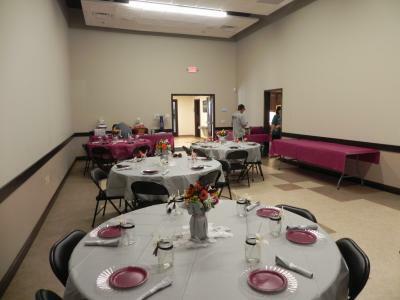 There is no additional charge for the use of the caterers kitchen if the prescribed rental fee has been provided for. Also, there are no table covers for the tables and should be arranged for by your caterer. Alcohol service during your event incurs the additional cost of $50.00 for use of the facilities. As well, the renter shall provide an additional “host” insurance coverage certificate of up the $1,000,000.00 naming the Lost Railway Museum as the additional insured. We can certainly arrange a Museum Tour for your guests with a minimum donation of $ 3.00 per guest, or a minimum of $ 150.00 additional. If you’d like to do so, please make those arrangements with your rental agreement so that we may have a competent docent available to help with the tour. A deposit amount equal to the rental rate is required with the agreement when submitted. Dates are available on a first-come, first-served basis. Please contact us for a specific date availability. While the calendar on the website may indicate the date is open, a reservation can come in at any time. We will endeavor to keep the calendar updated daily. In the event a rental party must cancel their date, we require a 15-day notice to return your deposit (less a 25% cancellation fee). Cancellations made less than 15 days in advance of the event date are non-refundable. A final count on the number of people you expect to attend your event is due two weeks prior to the event. If you need to add to the count after that time, you must contact the Museum to find out if that is possible. Parking is available on the street and at various parking lots in the area, including the Lions Club Parking lot next to the Lost Railway Museum. Most parking is available and easily accessible in the evenings, but much of it is taken up during normal business hours. Please stop by to determine other parking needs to see if we can accommodate more than 50 cars. There are various parking locations in the Village, but you may need to provide a shuttle service from those lots to the Museum. You are welcome to decorate the room with your own decorations. They might include colored table linens, flowers, chair covers, etc. 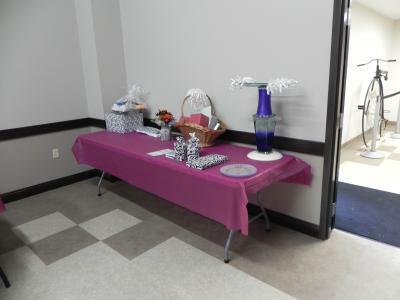 If you wish to decorate the banquet room please provide the setup up time clearly on the application and contract forms. You must not tape decorations to the walls or chairs in the banquet room and the application of helium balloons will require a $ 50.00 decoration damage deposit. This is the actual cost to get out a ladder high enough to remove balloons that get entangled in the ceiling and light works in the facility. After your event, we ask that you clean up your own decorations and that the caterer cleans up the kitchen area. If your event is after hours, your rental time runs until the two rooms are empty of decorations, musicians, and DJ equipment, etc. 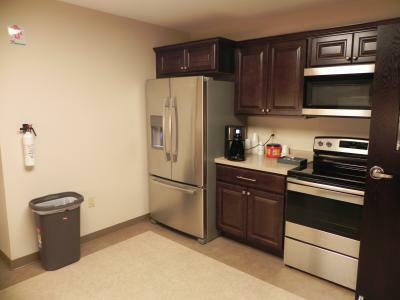 A dumpster is provided at the west end of the building for disposal of all trash in the kitchen and banquet room area. Our wall mounted screen and ceiling mounted projector are available for video and power-point presentations at no additional charge, but the setup of the equipment must be made by Museum personnel. Standard WiFi is also available and the guest service is also available at no charge. Be sure to seek the guest password from the manager of the facilities. You are liable for any damage done to the premises during your private function. Lost Railway Museum is not liable for loss or damage of any personal property. Again, helium balloons require a $50.00 damage deposit. Any balloons caught in the lights and ceiling equipment will cause the forfeit of that deposit. A Museum is not a particularly suitable area for small, unsupervised, children, but we strive to provide a family-friendly atmosphere. Children are certainly permitted in the banquet facilities and if you add a tour of the Museum, children under 10 years of age are allowed at no cost. But it is imperative that they be watched carefully to not touch, or climb on, any open displays of equipment or materials. Parents are reminded to keep children behind the designated rope, or stanchion lines. We welcome your non-profit organization for fundraisers and other events in the banquet facility, but please contact the management for rate information. Generally, dates for rental of the banquet facilities are fairly wide open except for Tuesday & Thursday afternoons when the Museum tends to get bus tours to the facility. It is also not available for most holidays during year, (Memorial Day, 4th of July, Labor Day, Christmas Day, New Years Day), and as well, during Heritage Day (the first Saturday after Labor Day). Similarly, the first Monday of every month when the Lions Club holds their monthly meetings are unavailable. Be sure to check the calendar on our website at www.lostrailwaymuseum.org to determine any other conflicts that may be caused by special events in the Village, at the Lions Club, or at the Museum itself. Please be advised that the facilities are a smoke-free environment with many valuable artifacts housed, or on loan in our facilities. Smokers may only engage outside the facilities where the trash cans have disposal boxes.